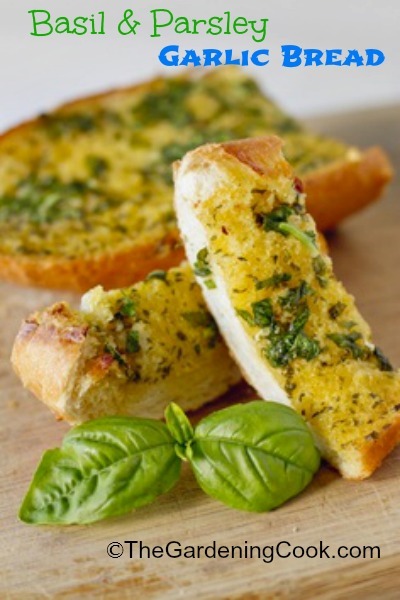 Garlic bread is a must have accompaniment to many main course dishes. It goes well with anything from Italian dishes to simple salads. This recipes combines butter with basil and parsley for a great taste sensation. This garlic butter bread recipe is super easy to do and tastes a LOT better than any garlic bread that you might purchase at your local market. You can even make extra of the butter spread and keep it in the fridge to easily make garlic bread any time that you want it. I used fresh herbs. Dried work fine too, but they won’t give the same type of flavor that you will get from using the fresh variety. For more recipes, please visit my recipe site Recipes Just 4U. Try this garlic bread with my homemade marinara sauce with pasta for a hearty and delicious meal. It is easy to make home made garlic bread in just minutes. Fresh basil and parsley give the bread a very savory taste. Combine the butter, parsley, basil and garlic until it is a paste consistency. Cover and microwave until butter is melted. Stir in the parmesan cheese. Cut the bread in half lengthwise; place cut side down on an uncovered grill over medium heat for 2 minutes or until lightly toasted. Brush cut side with the butter mixture. Grill or broil 1-2 minutes longer.